'five-star' luxury en-suite room on first floor. Contains a quality bathroom with bath, shower and toilet within the room. Kingsize four-poster bed (Jacobean mahogany, memory foam mattress) Sofa and easy chair. Large screen TV. Two double Georgian sash windows. 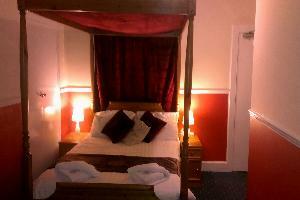 Single bed can be added for third guest (£20 per night). » Includes Full Scottish Breakfast cooked to order, plus unlimited cereals, tea/coffee/hot chocolate and toast. En-suite room on third floor. Four poster bed, contains a shower and toilet within the room. Quiet garden side of building. Triple en-suite room on 2nd/3rd floor. Contains a shower and toilet within the room. Quiet garden side of building. Double bed and single bed. Double en-suite room on 2nd or 3rd floor. Contains a shower and toilet within the room. Double bed. Twin en-suite room on third floor. Contains a shower and toilet within the room. Superior Twin/Double room on the first floor. This garden-side room has quality furnishings and bedding and a quiet end-of corridor location. Private shower-room and WC just two metres from the room. Please state bed preference. The larger of our Superior rooms on the first floor. Working Victorian shutters and a hot/cold sink unit within the room. This garden-side room has quality furnishings and bedding and enjoys a quiet end-of corridor location and modern shower-room. Contains a double bed. Spacious room containing single beds with private adjacent bathroom. Situated on second floor. Bathroom contains a shower and toilet. Prices based on up to 5 guests.